I had to go to my mom's house yesterday and pick up my kids. I asked my mom if I could borrow one of the photo albums so I could scan some pictures. The first one I picked up fit right into the years I was talking about the other day. December 21st, 1979 my mom married my step dad. I mostly just call him my dad when I'm talking about him. I also call my other dad "my dad" so it probably gets confusing when I'm talking to people. So here's my mom and dad on their wedding day. 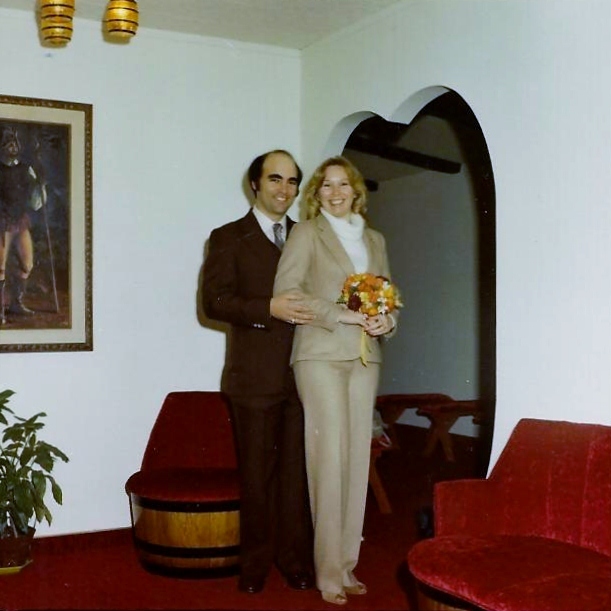 They went to Tahoe and got married all by themselves. Didn't take me or their parents or anything. Kind of weird when you look back on it but in a way it was nice too I suppose. No having to worry about everyone's drama. My mom looks so classy in her suit, don't you think? The story goes that they decided to get married at that time because every year for Christmas we all went and spent the night at my Grandma's house. Apparently they had to be married to spend the night in the same room so that was the driving force. Funny. Somehow I think that they were talking about getting hitched before that. So we all spent the night at my Grandma's for Christmas 1979. Back in those days I would be with my (real)dad for Christmas Eve and then he'd drop me off at my Grandma's late at night. The whole family would spend the night, which sounds like so much fun but I barely remember it. 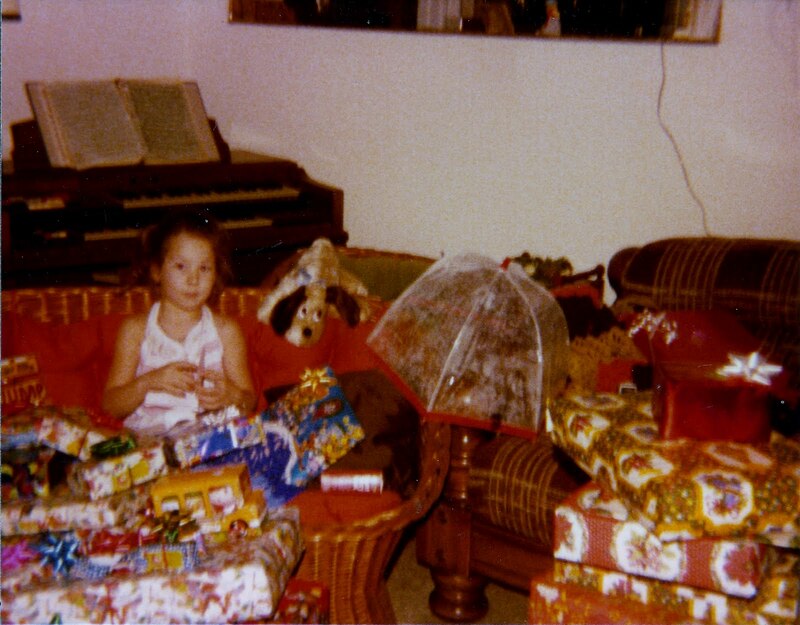 I mostly remember sleeping on the couch and waking up to Santa being there. I must have been a pretty good sleeper to sleep through Santa coming in the same room. This year I was still the only grandchild and niece. My mom is the oldest and it took everyone else awhile to have kids. I was obviously spoiled. Behind me is my Grandma's organ. I loved that thing. You could push a button and the keyboard would light up with the notes on them. She got that after she got divorced from my Grandfather and apparently she would play it, and get so worked up about it, that she would start crying when she made mistakes. Her kids would all kind of roll their eyes when the organ was brought up. Not happy memories for them lol. 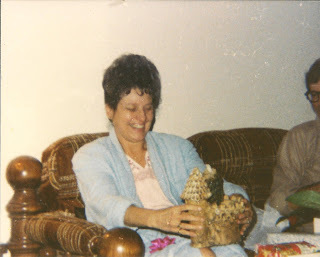 And here's my Grandma. Doesn't her hair look great for the early morning. Everyone is still in their pj's and Grandma has an updo. Must have been a lot of hairspray in there I'm thinking! Our family tradition is that all presents are opened from the youngest to the oldest. Everyone waits their turn to open their presents. It's nice when you are the youngest. When you are one of the oldset it bites a bit, but really your presents aren't usually all that exciting when you are older anyways. This served two purposes. Everyone got to see what everyone got and the little ones can go off and play with their toys while the adults finish up. After presents we must have had breakfast but I don't remember that much. I just remember our big family dinner which was usually followed by the guys all playing dice. Fun times, fun times. I love these old photos. i love old photos and family stories. I have been meaning to stop by and show some love but for some reason I cannt access your blog from work. Which is where I do all my internet slacking! I will be back to read some more later. Got to run some errands!